Bee Tee Dee discusses the ins and outs of character development and admits that he’s not exactly a creator of the Charles Schulzian variety. Bee Tee Dee determines that RoboCop’s spiritual successor already exists. Unwinnable presents a Bee Tee Dee how-to comic on various ways to exit a party – just in time for New Year’s Eve! Bee Tee Dee delves into the weird world of American Horror Story and finds it to be a fun, bizarre place. Bee Tee Dee imagines Kevin McCallister in his early 30s, still up to his old tricks. Bee Tee Dee takes a cinematic look at what fun abilities we can look forward to in the afterlife. ‘Tis Halloween time, and Unwinnable’s Bee Tee Dee felt compelled to illustrate “The Hearse Song” (or as you kiddies may remember it, “The Worms Crawl In”)! Bee Tee Dee pays tribute to the Howard & Nester comics from Nintendo Power , while searching for the name of their anonymous creator. In Darren Aronofsky’s film The Wrestler, the titular character bonds with a neighborhood kid over a game of Wrestle Jam, a fictional NES game created for the movie. In this comic, Bee Tee Dee recreates the scene with Paul Westerberg standing in for Randy ‘The Ram’ Robinson, and an imaginary NES game based on the Replacements album Tim. Unwinnable takes a look at the revival of the “Kiddie Ensemble Adventure” in J.J. Abrams’ Super 8. Bee Tee Dee looks at the things that keep videogame players motivated to plow ahead. Onion Co-Founder Scott Dikkers’ comic strip Jim’s Journal has returned, in webcomic form! Improving the Worst Videogame Box Art Ever! BTD tries to use his artistic powers for good to give a makeover to the worst videogame box art of all time, just like Oprah. Unwinnable presents a defense of the Julie Taymor musical, Spider-Man: Turn Off the Dark, written by Bee Tee Dee. ED-209 goes house hunting and RoboCop delivers a warm holiday greeting. Bee Tee Dee reveals the dark origins of… Nightmare Fuel! 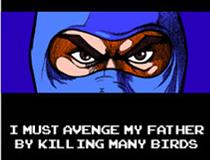 Bee Tee Dee brings us another great comic strip, this time starring the Unwinnable vulture! 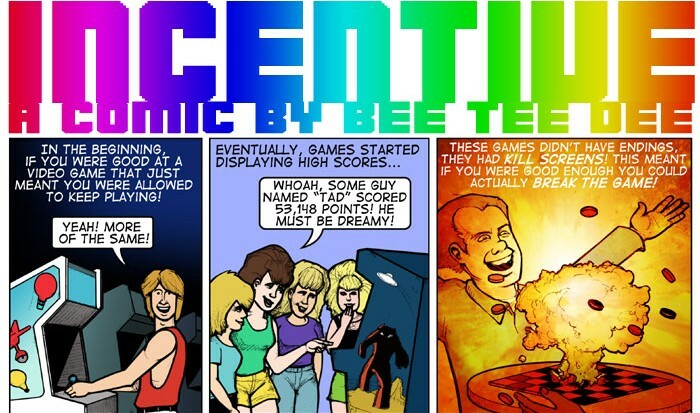 Bee Tee Dee takes a hilarious look at storytelling (and the lack thereof) in videogames for his first Unwinnable comic strip.